A fun, safe way to spend the day! Does your dog love to romp, play and socialize with others? Don’t leave him cooped up at home all day. Send him to daycare! Are young (or young at heart) and full of energy. Need more exercise than their busy owners can provide. Enjoy the company of other dogs and people. Make their own “fun” when they’re bored. Become anxious or depressed when left by themselves. Have owners who want a safe, fun place for their dogs to play. 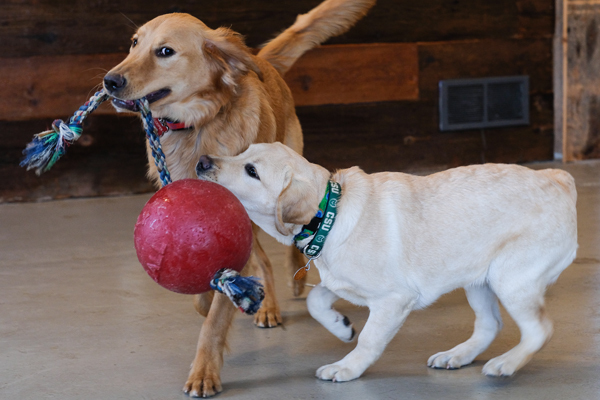 At Good Dog Daycare, your dog will enjoy small group play in a comfortable, clean environment. Campers are always carefully supervised by our experienced, professional staff, and we closely monitor group dynamics to ensure everyone has a happy, positive experience. In addition to playtime and other stimulating activities, we always provide plenty of love, one-on-one attention, belly scratches, ear rubs and praise for being a very good dog! Ready to send your dog to daycare? Let’s make sure we’re a good fit! To ensure a safe, enjoyable environment, all dogs must be up-to-date on vaccines and have their temperament assessed prior to enrolling. If it turns out that day camp isn’t up his alley right now, don’t worry! We may have other options. CONTACT US today to schedule your free evaluation! Want your dog to come home better behaved? Ask us about dog training at daycare! We heard about Good Dog Camp through people in the community. Annalissa was not only comfortable with our dog, but we are confident that we would not have been successful without her. We would strongly recommend Good Dog Camp to any dog owner.